Old Palm Golf Club | Old Palm News - Who wrote the book of love? In this case, it was German journalist Jan-Phillip Sendker. 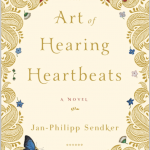 He wrote âThe Art of Hearing Heartbeats,â a poignant love story passionately discussed at a recent Ladies Book Club meeting at Old Palm Golf Club. While enjoying tea and cookies, the ladies offered their heartfelt views on the romantic page-turner, Sendkerâs first English-language novel. The book concerns a successful New York lawyer who suddenly disappears without a trace. After finding an unmailed love letter he wrote to a Burmese woman, the manâs daughter goes in search of her, hoping to discover the secrets her missing father never shared. What unfolds is an unimaginable tale of hardship, resilience and passion, meant to renew oneâs faith in the possibility of real, pure love. The Ladies Book Club meets monthly in the ladies lounge in the Club to discuss the latest bestseller or simply favorites that may have been recommended. Next monthâs book is âLight Between Oceansâ by M. L. Stedman. All the ladies of Old Palm are welcome to join in.